I have to admit, when I first heard about essential oils, I thought it was a scam. I was totally put off by the crazy people who were obsessed & making big claims; plus, the fact that network marketing companies were involved certainly didn’t help provide credibility. I started slow, trying a couple oils and seeing results for myself. That lead to lots of research on the safety and efficacy of oils, as well as on the companies that sell them. That research convinced me, and since then, I’ve totally joined the oil bandwagon. I’d heard people say essential oils were biblical, but truly thought that was just part of the “cult.” I knew the wise men brought frankincense & myrrh to Jesus, but was taught in Sunday School that those were more like “perfumes” because people didn’t shower or have deodorant. And, I had heard of “anointing oil,” but thought it was simply olive oil. There’s a whole lot more in Scripture about essential oils than I ever could have imagined, and it’s quite compelling. I was quite convicted that regularly using essential oils is quite scriptural and something I should be taking advantage of as a gift from God. God intended us to use plants for nourishment and healing. Eating fresh herbs and vegetables is, of course, essential to health. But another avenue of getting these healing properties is through essential oils- called “essential” because they are the essence/the life of the plant. Many pharmaceuticals are designed to block receptor sites or give false information to cells in order to trick the body out of its symptoms. Drugs often mask the problem instead of actually fixing it. God uniquely created essential oils to help heal our bodies, not just mask the symptoms. They work toward restoration and healing rather than causing confusion and chaos in our cells like drugs do. You can apply many different oils at once because rather than inter-reacting and causing problems like medications would, they all work together to bring our body to health. In 2 Chronicles 16:11-14, King Asa “contracted a disease in his feet” that continued to worsen. Instead of seeking God, he sought the aid of physicians and he ended up dying. This is not at all to say you should not seek treatment from a trained doctor, but the lesson this teaches me is to seek God first when I’m sick rather than putting my full faith on worldly medicines. In Luke 8:43-48, Luke, a physician himself, tells the story of a woman who bled for 12 years, seeking many different doctors and spending all her money doing so without anything working… how many of us can relate? Then, she encounters Jesus- she touches his robe with full faith and is healed. God is the ultimate source of healing. Healing is a holistic spiritual term, not a medical one. Medicine doesn’t heal us. It doesn’t cure us. It addresses symptoms. Only a holistic approach can truly heal you. Where do you turn first when you are sick? We all know how antibiotics are predictable and consistent, so the bacteria can learn to adapt and become resistant. The opposite qualities make essential oils so advantageous when fighting infection… there is so much variability with essential oils, bacteria cannot learn it. That’s why the effectiveness has still not diminished after thousands of years of use. Created by God, essential oils can distinguish between good and bad bacteria like they do in nature and can fight against viruses. Thieves essential oil has been proven in testing to kill 99.96% of airborne bacteria, and cinnamon bark oil has been comparable to penicillin and ampicillin antibiotics. In Numbers 16:46-50, Aaron stops a plague among Israelites by fumigating (old-school diffusing) the essential oils of frankincense, galbanum, onycha and myrrh. Myrrh is the most referenced oil in the Bible. It appears in both Genesis and Revelation, and was offered to Christ at his birth and at death. It was commonly used at the time because it enhances all other oils, causing what it’s combined with to last longer. Myrrh supports immune system, soothes skin, elevates mood and relieves stress, oxygenates cells, repels insects and prevents mouth infection. And it’s helpful for newborns for umbilical cord healing, coughs, sore throat, thrush. There are different words in the Bible to distinguish gradual vs instant healing. The Greek word “iaomai” for healing means miraculous or instantaneous and is found 30 times in the New Testament (Matt 8:13, Luke 8:47, John 12:40 as examples). The other word “therapeuo” is found 40 times (Mark 1:34, Luck 5:15, Acts 5:16 as examples) and means “to serve, to attend to” – healing over time with care. In Mark 6:13 and Revelations 22:2, two verses quoted above, the word “therapeuo” is used; rather than indicating instant miracles, God asks that we care for the sick and ourselves and use the natural medicines he has provided to do so. One last note that’s changed the way I use oils: in the Biblical application of oils, it was always with prayer. I believe prayer will heal on its own and oils can too, but the combined power is much stronger. Our sense of smell is different than any other… everything we smell passes through the emotional part of our brain first. All other 4 senses go to the rational brain first. Scientifically, we know there is a strong link between smells and recalling emotions. The fragrance of essential oils can literally touch our emotions; emotions that cause pain, illness, malfunctions on all levels – physical, mental, social, emotional, spiritual. Beyond helping with immune function, frankincense, sandalwood, myrrh, cassia and cedarwood, all commonly used in the Bible, can help bring feelings of happiness. Cedarwood is a great example of an oil with emotional uses. It clears the mind, increasing the ability to think with clarity. This oil has the highest concentration of sesquiterpenes (98%) – a property that helps it go directly to the brain upon inhalation. King Solomon chose cedar as the wood for his home and for the temple – how perfect for making decisions and wise judgments and meditating. We should not forget what a valuable resource we have to use not only when we are sick, but also when we feel discouraged, stressed, overwhelmed or anxious. The most common use of essential oils was in worship and service to God – in sacrifices/offerings, in anointing, and in prayer. In Exodus 30: 22-38, God gives very specific instructions to Moses for how to use essential oils for worship. The “holy anointing oil” contains 84% essential oils of Myrrh, Cassia, Cinnamon, Calamus and 16% olive oil. Then God gives a recipe for incenses, which was burned in temples by Jews and early Christians and still to this day in orthodox churches. The Lord was insistent that the holy anointing oil and incense was holy, for Him alone and not to be used as a commercial perfume. These verses indicate the importance of how oils, created to bring spiritual awareness, should be used in our worship and prayer to God. 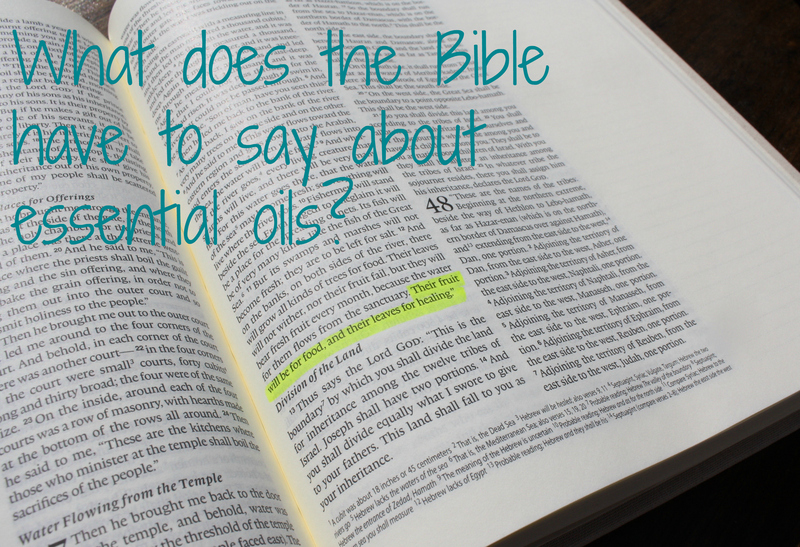 If you’d like to study more, I would highly recommend the book Healing Oils of the Bible – it helped me understand so much on this topic and is the source, besides the Bible, for much of the information in this post.